Uzbekistan is a power in the Asian boxing map which nation hosted an International Youth Tournament in Zangiota at the Tashkent Region. Uzbekistan’s excellent future hope Zakirkhodja Madiyev and Tajikistan’s Abdurakhmon Yokubov performed well in the competition and won the titles in Zangiota. Boxers who were born in 2000 and in 2001 were eligible to compete in this International Youth Tournament. Those athletes who attended in the Budapest 2018 AIBA Youth World Boxing Championships were not able to fight in Zangiota. Uzbekistan’s new star AIBA Youth World Champion and ASBC Asian Youth Champion Abdumalik Khalokov is taking his rest after his big success in Budapest. Altogether 102 boxers attended in the competition from the Central Asian region and the athletes fought in 10 different categories. The first gold medal was achieved by Umid Jurayev who defeated most of his opponents by RSC in the International Youth Tournament and won the title of the light flyweight (49kg). The gold medal of the flyweight (52kg) was achieved by Ulugbek Aktamov who defeated Bukhara’s Nozimjon Nasriddinov in the final. Heydar Aliyev Junior Cup winner Amirbek Ibodullayev arrived to the event with the best pedigree at the bantamweight (56kg) but the young Uzbek was defeated by his teammate Khusanjon Karimov of Ferghana in the final. Tajikistan’s Abdurakhmon Yokubov attended in the Bangkok 2018 ASBC Asian Confederation Youth Boxing Championships with success and he had a quick final at the lightweight (60kg). The 18-year-old Tajik boxer started in different rhythm than his Uzbek opponent Zhanbolat Yermakhanov and the referee confirmed his RSC success. 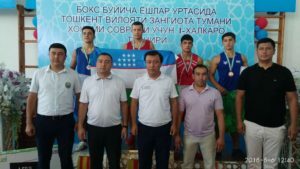 Uzbek Junior National Champion Jakhongir Yuldashev won the Amber Gloves Youth Tournament in Russia therefore his success over Sardorbek Ganiyev of Andizhan was not a surprise at the light welterweight (64kg). Abdumalik Boltayev is the best boxer in Tajikistan from their 2001 age group but his triumph over Uzbekistan’s experienced Temurbek Sadullayev was a sensation in Zangiota. Kenes Omarov Youth Memorial Tournament runner-up Zakirkhodja Madiyev claimed medals in the previous strong international youth events and the local middleweight (75kg) boxer continued his technician style in Zangiota where he was too strong for Ferghana’s Odiljon Jurabayev. Andizhan’s Akhrorbek Nishonboyev has got also great international results and his experiences paid off when he met in the final of the light heavyweight (81kg) with Russia’s Anton Surkov. Bukhara’s Asadbek Normatov impressed in the semi-final with his fast RSC success and controlled his final against Mukhammadkodir Nematov in Zangiota. The last gold medal of the International Youth Tournament was captured by a local hope Samandar Zhaparov who landed effective punches against Mirmukhsin Makhmudov of Ferghana in the final of the super heavyweight (+91kg).